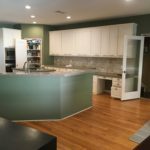 Over the past 5 years we’ve done a ton of updating on our house. Since I’m always getting asked, I’ve shared my list and thoughts. Scale is 5 stars, we highly recommend them – 2 stars and below, go elsewhere. 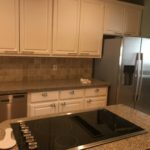 Eric Harrison Builders – 5 Stars – Eric remodeled our master-bathroom, closet, and laundry room. We can’t say enough good things about him and the people he uses. 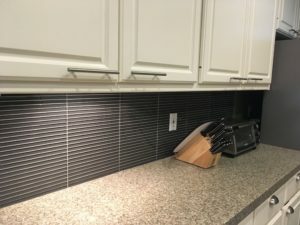 While his subs may be on the higher cost side, the quality and dedication are well worth it–his tile-setter in particular is the best we’ve ever seen. Hope to have Eric and crew back to do our staircase. 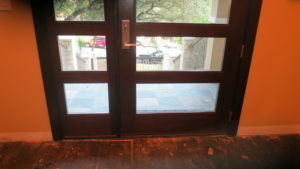 Marcus Heyns with Austin Doors & Trim – 5 Stars – Eric gave me Marcus’s name to replace our interior hollow-core doors. He was timely, friendly, and gave us a great price. 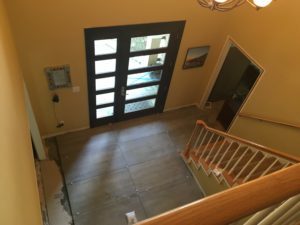 His crew replaced 11 doors in two days, and also fixed some of our other doors that weren’t perfect. He is extremely knowledgeable, committed, and detail-oriented. 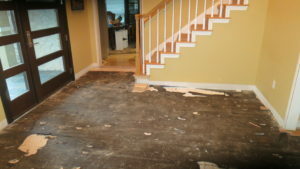 I will have his team back soon to make some adjustments we need due to our new floors. Ivan at Doors & Company – 5 Stars – Marcus gave us this recommendation. I met Ivan at the Doors & Company store, told him what I wanted, and he said he’d email me a quote. Once he saw what he had chosen, he suggested a non-name-brand version of the same door that would be half the price and have only a half-day lead time. 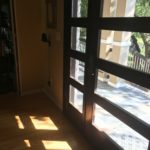 We went with the “generic” doors–they look the same and are of the same quality as the name brand. When the installation work began, the installers discovered that there was damage to one of the doors after they had already made a cut. I called Ivan and he and the distributor agreed to take back the door and absorb the cost, and we received a new door the next day. Incredible service – see Ivan for your door needs. RoofCrafters – 4 stars for the roof and gutters We had the composite roof replaced with a standing-seam metal roof and formed metal gutters. Besides a vent not being unplugged and one gutter leak (both of which they fixed(, Roofcrafters did a very nice, high-quality job, and our roof and gutters look great. I’d recommend them for roofing. RoofCrafters – 2 stars for the windows and doors – After the success with roof, we had them come back to replace the windows, some of the doors (mainly exterior) and install slate and new railings on our front porch/stairs. We had lots of issues. The one guy to whom they subbed the windows was slow and did not have a good eye for detail. We had a leak in one window for 18 months before they finally were able to fix it properly (http://www.skelmo.com/?p=749)–that leak was due to the installation and not the window itself. 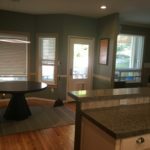 The windows (Milgard) are high quality, work well, and look great, The carpenter they hired for the railing was really good, but I think they got him in over his head. The railing took a lot longer than they estimated and then warped. The doors were from BMC and were of excellent quality, but the painter they used did a really sloppy job of staining the new doors in the bedroom. As part of the project, we also had masonry work done, the mason they used was excellent. If we had to do it again, I’d use Eric, Marcus, and Ivan for sure. build.com – 3 Stars – We bought all our door hardware from them. The first order for the exterior doors was perfect. The order for the pocket doors in the bathroom, closet, and laundry room was a disaster. When the first shipment arrived, it was the wrong finish (polished brass instead of polished nickel). Build.com set up the exchange promptly, and made it relatively easy to return the incorrect order. However, the shipping dates kept moving, so we waited and waited (after calling a few times in between), and then, the next order was exactly the same as the first (polished brass again), even though we had confirmed that it was indeed ordered correctly. On the third try, they finally got it right, but all of these mistakes caused a delay of probably eight weeks. The customer service agents at build.com were always helpful and sympathetic, but they blamed Emtek (the manufacturer) for getting it wrong. However, we called Emtek and they had the correct finish in stock, and could not check on the order because it had come from a third-party distributor–they told us they do not work directly with any online retailer. So Build.com gave us incorrect information, would not (or could not) tell us where the hardware was actually ordered from, and there was no way for us to check directly to ensure that the same mistake was not made again. So we had to ship back the wrong order twice, and wasted way too much time on the phone talking about pocket-door hardware. 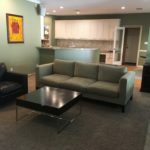 supply.com – 1 Star – We bought some high-end Robern medicine cabinets from them. Their prices were a bit less staggering than some of the other retailers, and they promised relatively fast delivery. However, when we received the boxes from Fed-Ex, I knew we were in trouble. The thin cardboard box they shipped them in was destroyed and obviously had broken glass inside. Normally I’d chalk this up to shipping damage, but they shipped a very large item made of glass in a retail package with no styrofoam or other appropriate packing material. There is no way anything breakable would have survived. 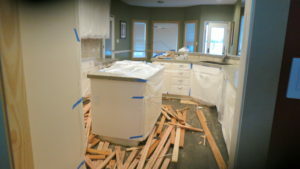 Moreover, the broken cabinet was not even to the specs we had ordered (it was eight-inches deep instead of four). The other one was packed better and was of the correct dimensions. 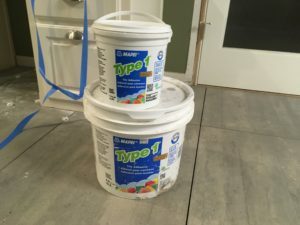 Of course mistakes happen, but when we called and e-mailed supply.com about the issue, we got passed around and could not get anyone to pay attention or address the issue. Invariably, they seemed “put out” and wouldn’t return calls or respond to e-mails, except to tell us they had reordered the correct cabinet and it would arrive in several weeks. 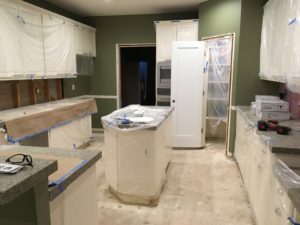 There was no effort to expedite the order, and similar to build.com, the people at Robern (owned by Kohler) were great but were not able to help. Because supply.com wouldn’t give us the distributor’s information or order number, Robern had no way to look up the order or check status. Supply.com then offered a “refund” in a passive-aggressive response to our request that they expedite the shipment. So it took several weeks for the replacement to arrive. At least this time, it was the correct cabinet and was packed very securely. I won’t buy from them again (although we would highly recommend Robern medicine cabinets–they are worth the obnoxious price). Miguel Lopez – 5 Stars – Miguel did all of the baseboards and trim on our neighbors house. We wanted 100% of the baseboard-, window-, and door trim removed and replaced. 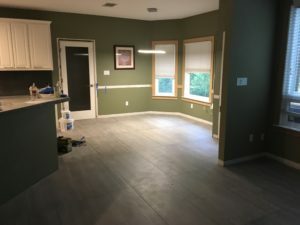 Miguel and his associate came over to the house on a series of three weekends and patiently removed it all and replaced it with wide, modern, straight baseboards and trim. Miguel works for a lumber yard so he gets the material at a discount and picks it up and delivers it himself. 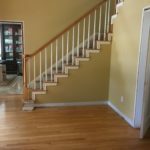 We paid him the cost of the material plus labor at a set price-per-foot of trim removed and replaced. They were excellent all around. Churchill’s Fireside & Patio – 4 Stars – We went to Churchill’s to freshen up our fireplace. We had a stock black iron fireplace with a dirty metal screen and a gas pipe. Churchill’s came out and removed the old “innards” and installed a remote-control artificial log set-up, which looks great and generates a lot of heat (with an adjustable flame). They also measured for a stainless-steel fireplace “frame”/surround that attaches via magnets to the old ugly metal. The only reason I did not give them 5 stars is that the magnets came welded in the wrong place and had to be sent back. The final product looks great, is really heavy and of excellent qualify, and has held up beautifully. 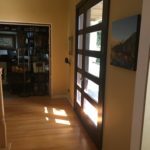 The Front Door Company – 5 Stars – We wanted to replace the dated, generic front door with a more modern, tall, solid wood door and side-light panel, Tracy worked with the Front Door Company to design a new door exactly as she had envisioned. It was expensive, but the process was smooth from start to finish, and the door turned out beautifully. The craziest thing was that one young guy came out and installed this massive door (and sidelight panel) in one afternoon without any assistance. 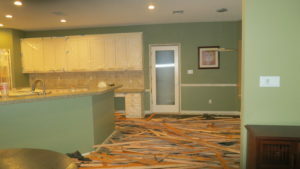 These guys are real experts, and everyone we dealt with during the process was professional, helpful, and really nice. It was well worth the price to get such great-quality work that ended up improving the whole look of the house. This entry was posted in Other on November 13, 2016 by admin. 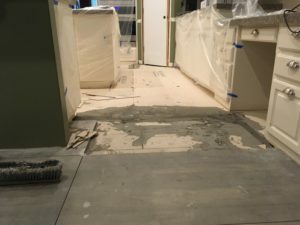 We decided to put in new floors. 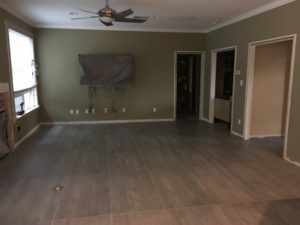 We went with Chase Flooring since I used to live next door to the owner and they did a nice job with our previous floors. They certainly aren’t cheap but they promised quality. I’ve been in sales for 25 years and I feel the sales guy did a poor job estimating the total cost from hardie board to sq ft of tile. However, biggest issue is there was little expectation setting done. The operations person was wonderful – she kept me sane and gave realistic expectations. 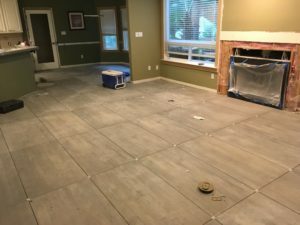 The tile job was estimated at 4 days – it took 9. The crew had little direction and certainly didn’t like getting it from me, but for what we paid, I expect as near as perfection as possible. 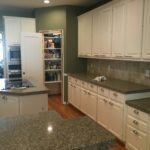 11/08 – They were here early to clean up and finishing grouting the back splash. They did as good as job as they could cleaning the big stuff, but the whole house needs a deep dusting and scrubbing. Now the long process of putting everything back. Also, we bought far too much tile, lots of left-over. 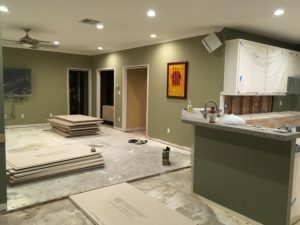 11/07 – They finished the floors and brought back the fireplace material. One of the guys stayed late and put the fireplace up. Looks great. 11/05 – 11/06 – Both guys worked both Saturday and Sunday. They did what they could, but ran out of grout and the fireplace material hadn’t arrived. 11/04 – Install proceeding but only one person most of the day – pictures below. Drama of the day was Tracy was supposed to pick grout from 2 pamphlets they left behind. The pamphlets describe not only the color, but the different options. In detailed Tracy fashion, she researched all the options of sanded, un-sanded, and epoxy. She sent an email with the choices. I get a call from the sales in the am. He is miffed and saying they don’t do that, etc, etc… I was tired of it all, so I had him talk to Tracy who asked for advice since he was the expert…. no response. In the end, they used the type she picked which doesn’t stain nor have to be sealed – not sure why it’s not the default choice always. 11/03 – Carpet did go in as planned today. There were many on the crew and they worked fast. Carpet looks great. 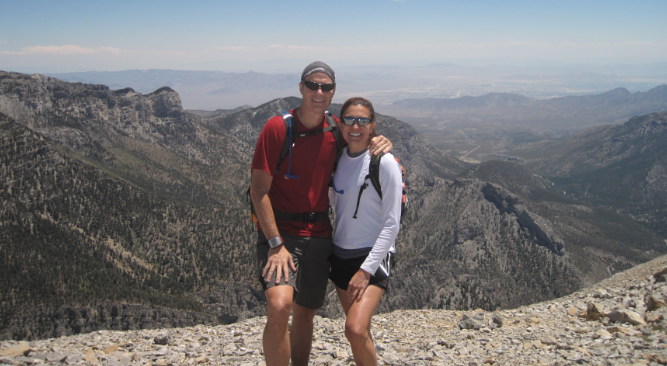 11/03 – Partial crew today – slow going and it started to rain. 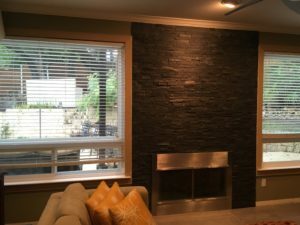 New twist is that they ran out of hardie board so I got a call from the sales guy that they needed more and he needed to charge me another $900… I tried to understand why that it my responsibility when he bid the job and was onsite for the bid. There wasn’t any surprises with the tear out. He basically said that it’s a change order, but his quote doesn’t even detail the amount of material so how am I even to know how much was included. I just want this over with, so I said to do it…. really frustrating since it appears there is zero accountability to doing the job right the first time. 11/02 – Rest of the day progressed – once the wood from the prior install was removed – everything matched perfectly. 11/02 – On the way back from home depot, got a call from the sales guy that they were going to charge me more to fix the issue. I pointed out that they were fixing their problem. He basically said tough… I was ticked, not that it was going to cost more, but that they created the problem and wanted me to pay to fix it. 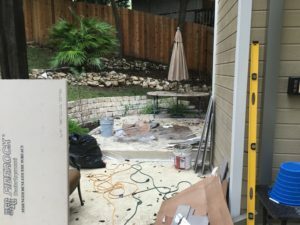 On top of it, he said that the installers didn’t like me checking on their work – I asked him which is it, should I let them make mistakes like they did before or take responsibility to make sure it’s done right since the company didn’t seem to care? In the end, I gave the crew chief an extra $100 for the extra work – they shouldn’t be in the middle of it. 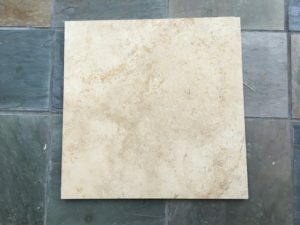 The installation price I paid to replace the floor with tile (not including the tile) was ~$8/sq ft so I don’t think a high expectation is unwarranted. I bought the crew sandwiches. 11/02 – 9am One thing that I noticed the evening before is the last tile install (done by the same company years before) was done incorrectly. 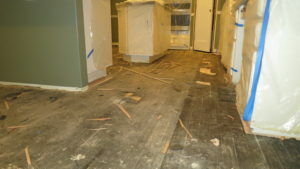 They had laid tile on top of the wood floor plywood and even one board of the wood floor. It would cause an uneven floor. I had 4 spare pieces of tile and found 3 more at home depot. 11/01 – 11:00am Truck here and3 guys working now – hopefully demo and clean-up will be done today. 11/01 – 8:15am no one here so I call the ops manager. It’s 8:35 now and 2 guys just showed up- not the 4, I was told would be here. 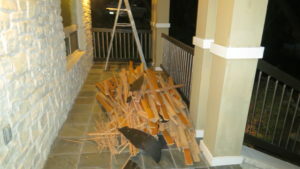 10/31 7pm – wood is outside and the guy leaves. 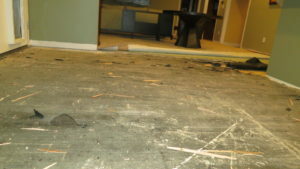 The plywood is covered in nails and we have to walk around the house to get through it. 10/31 – Around 3:30pm the supervisor shows up. He jumps right in and starts tearing up the floor. 10/31 – 2:01pm He comes back alone. I email the ops manager and she refunds the furniture moving charge since I’m going to need to help him. She says she will send the supervisor. 10/31 – 1:13pm I called the ops manager to see if they are coming back. I’m told they will be there in 15 min and he had to pick up the rest of his crew. 10/30 – I spent most of the day packing everything and disconnecting all the electronics. 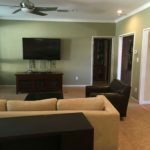 Besides the large furniture, the house is fully prepped. 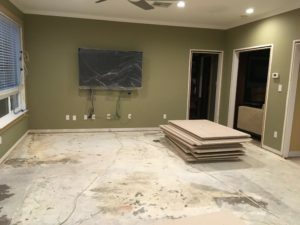 10/28 – 11:01am – Tracy stayed home from work for the install, since I had to set-up for my event – she called the operations manager only to find out the sales guy was supposed to call and let me know the carpet hadn’t arrived. 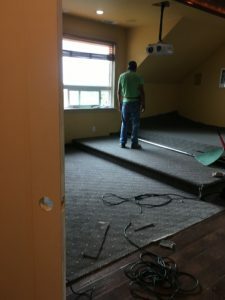 “the carpet is not in yet and will be in till next week. 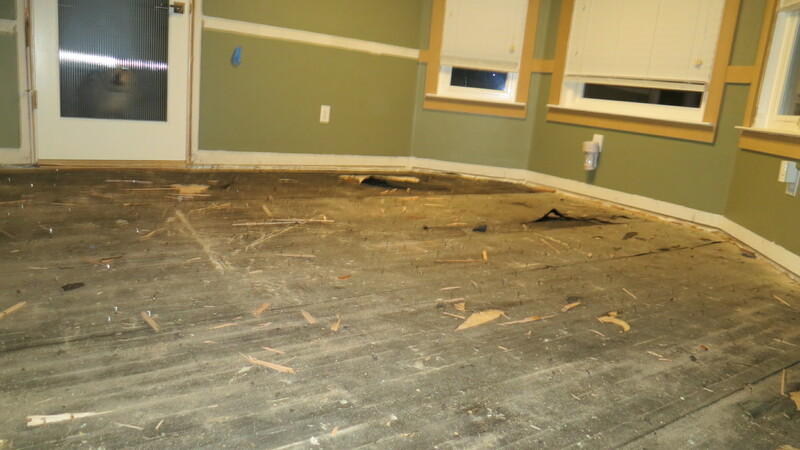 Carpet is always after tile install, even though separate areas.” Maybe the appointment shouldn’t have been made? 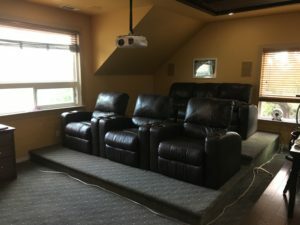 Frustrating since I ripped the media room apart for this and had to push back the trim guys and furniture installers. This entry was posted in Other on November 1, 2016 by admin.